1. 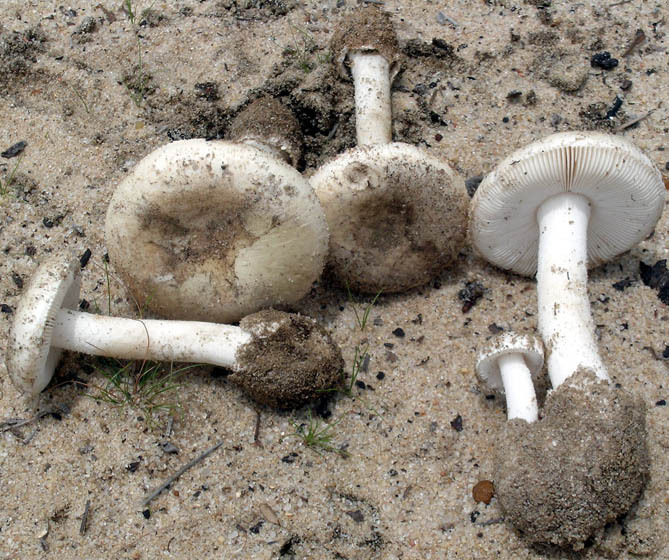 Amanita peckiana, Edmond, Oklahoma Co., Oklahoma, U.S.A.
intro For the present, please see the technical tab of this taxon page for details. author Kauffman in Peck. 1913. Mycologia 5: 67. ≡Amidella peckiana (Kauffman) E.-J. Gilbert. 1940. Iconogr. Mycol. (Milan) 27, suppl. (1): 77, tab. 25 (fig. 4). 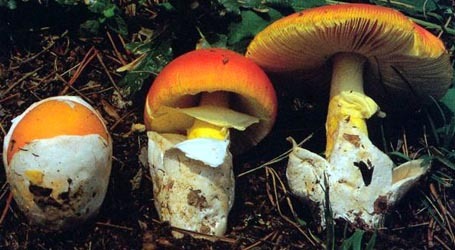 =Amanita baccata sensu Bres. in Beardslee. 1902. J. Elisha Mitchell Scient. Soc. 12: 2, pl. 1.
etymology Peck + -iana, suffix indicating possession; hence, "of Peck"
type studies Type study: Jenkins. 1978a. 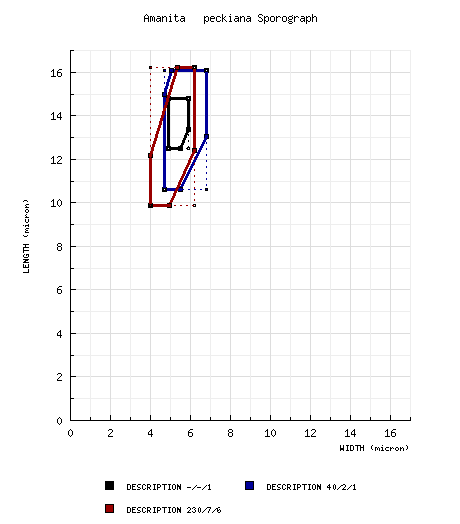 Mycotaxon 7: 37.
from type study of Jenkins (1978a): [-/-/1] 12.5 - 14.8 × 4.9 - 5.9 μm, (Q = 2.27 - 3.02; Q' = 2.60), hyaline, smooth, thin-walled, amyloid, cylindric to bacilliform; apiculus sublateral, cylindric; contents guttulate; color in deposit not recorded. from type study by RET: [40/2/1] (10.5-) 10.6 - 16.1 (-16.4) × (4.6-) 4.7 - 6.8 (-8.2) μm, (L = 12.7 - 13.7 μm; L' = 13.2 μm; W = 5.4 - 5.7 μm; W' = 5.5 μm; Q = (1.54-) 1.92 - 3.19 (-3.50); Q = 2.38 - 2.48; Q' = 2.43), smooth, amyloid, cylindric to bacilliform, occasionally elongate, infrequently ellipsoid; apiculus sublateral; contents not recorded; color in deposit not recorded. ecology Solitary to scattered to subgregarious. Oklahoma: Under Quercus stellata and Q. marilandica. material examined from type study of Jenkins (1978a): U. S. A.: MICHIGAN— Allegan Co. - New Richmond, 1912 C. H. Kauffman s.n. (holotype, NYS). RET: U.S.A.: MICHIGAN— Allegan Co. - New Richmond, 1912 C. H. Kauffman s.n. (holotype, NYS). NEW YORK—Suffolk Co. (Long Isl.) - Rocky Point Conservation Area, 25.ix.2000 Joel L. Horman 2 (RET 320-3, nrLSU seq'd.). OKLAHOMA—Oklahoma Co. - Edmond, Hafer Pk., 10.ix.2008 C. L. Ovrebo 4764 (CSU). discussion RET's old view that the subhymenium of this species was not composed of inflated cells must be attributed to his misinterpretation of the collapsed tissues of the holotype, which he reviewed when he was inexperienced. Modern collections of the species show he was in error. RET's provisional name "A. canadensis" should be referred here because his idea that he was viewing a specimen distinct from A. peckiana was based in part on the above mentioned mistake. An edited version of RET's type study should be placed on this page and supplemented by recently collected data. photo Dr. Clark L. Ovrebo - (1) Edmond, Oklahoma County, Oklahoma, U.S.A.
select a collection to review/add spore measurements..#794368. C. H. Kauffman, #s.n., U.S.A., MICHIGAN, Allegan Co., New Richmond, #794369. C. L. Ovrebo, #4764, U.S.A., OKLAHOMA, Oklahoma Co., Edmond, Hafer Park..#804878. C. H. Kauffman, #s.n., U.S.A., MICHIGAN, Allegan Co., New Richmond, #804879. C. H. Kauffman s.n. , #s.n., U.S.A., MICHIGAN, Allegan Co., New Richm..#804880. Joel L. Horman, #2, U.S.A., NEW YORK, Suffolk Co. (Long Isl. ), Rocky ..#804881. C. L. Ovrebo, #4764, U.S.A., OKLAHOMA, Oklahoma Co., Edmond, Hafer Par..